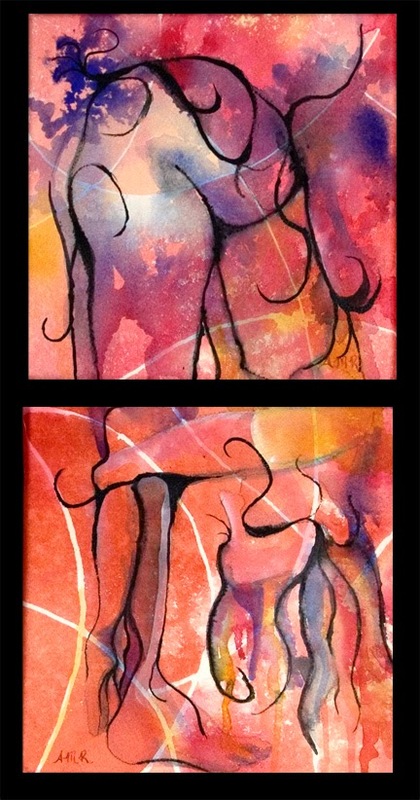 Here is the other second painting for the diptych, Stability. I've also included an image of the completed diptych. 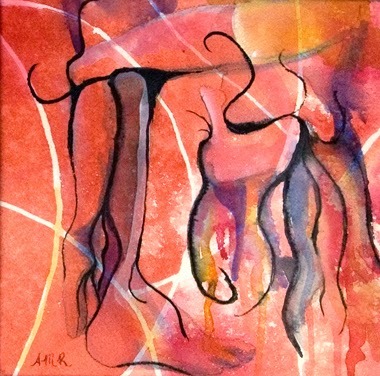 Like my other paintings in the 30 day challenge this is also a fluid acrylic painting on gallery wrapped paper. Each piece is 8" X 8" X 1.5" deep and varnished to protect the paper and the paint. So now the theme I'm using for the first part of January is probably obvious. I have selected six of the poses within the yoga "Sun Salutation." I've been wanting to work on figure drawings where there is a sense of depth and motion in the pose. I thought yoga poses might be an interesting subject to use for this purpose. I first practiced yoga in my late teens through early twenties. I've periodically resumed the practice, however I never learned much about the philosophy of yoga or the meanings of the chakras (energy centers) that can be enhanced through yoga. As part of preparing for the series I researched the chakras and learned a little about the poses, colors, and meanings associated with each chakra. I decided to use these colors as the primary color scheme for each pose. Many of the emotional interpretations of the colors that I have shared are based on the chakra. Stability is the forward bend pose used as the third and tenth pose in the "Sun Saluation". I love this set. (That's what I call 2 pieces that go together.) I think a series has to be 3 or more. Love the colors, motion and feeling of these, April. Thanks, Sandy. I knew series didn't sound right. I really like the concept and the resulting paintings! It took some pre-planning and research, but I'm happy with how these are coming out. Thanks.